It makes me really frustrated that I am still not the patient mom that I want to be. I think part of my problem comes from the fact that little children are constantly changing and are unpredictable. I have expectations in my head for how our day will go or how certain events will play out, and then BAM! Things get crazy. I constantly want to blame someone or their behavior and justify why I have gotten upset... but the truth is, no one can make me angry. It is my choice. I also get annoyed at myself often for feeling angry, when in fact, it is completely OK for me to feel angry or upset. How I deal with that anger is actually a bigger deal and more impactful than me actually feeling big emotions. Today I am going to share some tips for how to deal with anger and how to express anger productively. 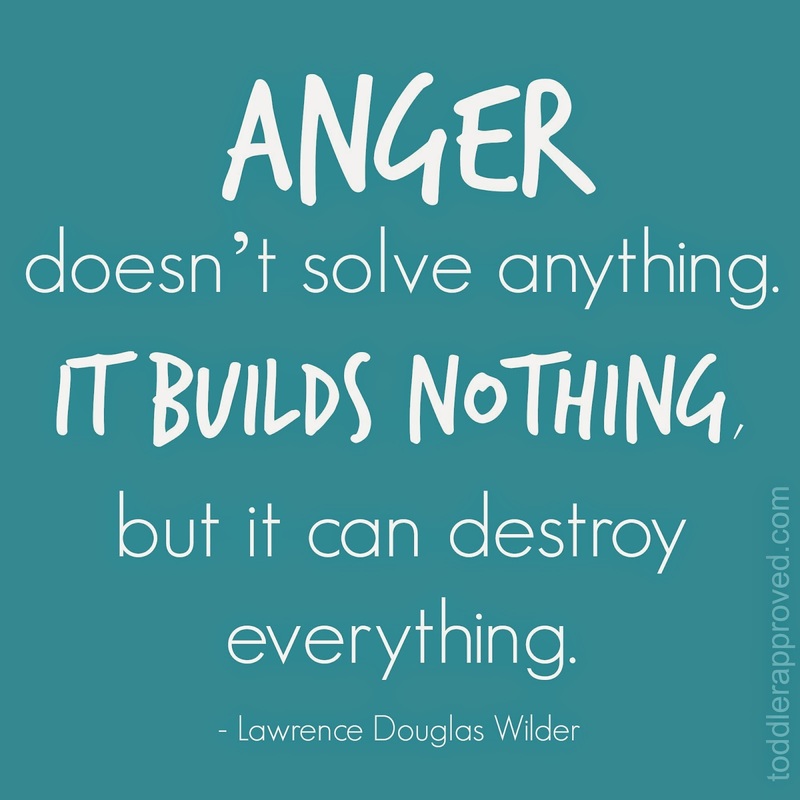 I am also going to share some of my favorite resources with you about anger. The quote is so true. Every time I deal with my anger unproductively I think of this quote and how I am slowly destroying my peaceful home and my relationship with my kids... and I make a decision to do better and try harder. Far too often I am thinking about the previous day late at night and I have to remind myself, "tomorrow is another day..." which is not only a favorite movie quote, but a great sentiment. Some people also withdraw and sulk when they are angry. Do you do any of those things like I do? By acting these ways, I am teaching my kids that those are the proper ways to handle angry feelings... and that isn't helpful! There are several strategies I use when I am feeling angry and want to deal with my feelings in productive ways. 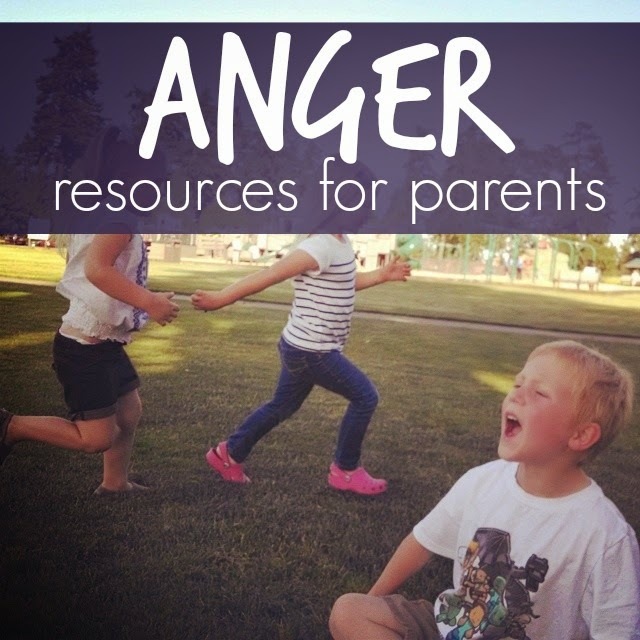 I shared several ideas in my post Eight Ways to Deal with Anger as a Parent. Here are a few other strategies for dealing with anger productively.. In the moment, when I feel like I am like a volcano that is ready to blow, it works best for me when I whisper or talk extra quietly and calmly (almost in an exaggerated fashion). If I visualize myself back as a teacher instead of a mom that also makes me shift into a more professional mode where my brain actually functions properly and I get less angry. Sometimes I have to remove myself from what is going on for a second (assuming kids aren't hurting each other) and take a trip to the bathroom and repeat to myself, "they are just little kids" or "it is not that big of a deal." When it comes to actually expressing anger, I am trying to learn how and do that properly... because I think it is actually fine to let my kids know that I am angry... I just don't need to yell or do it in a mean way. Kids shut down so quickly when yelling happens anyway, so if I do yell at my kids about something it is unlikely they learn anything from me other than that mom's emotions are a bit out of control. Focusing on how I am feeling, not on blaming people. That means I try not to blame my child for my response or my anger. I try not to say things like "When you fought with your brother it made me so mad that I had to yell at you..." or whatever. Like I said above, it is my choice to yell. I need to own that choice and try and stop it... not displace blame. Keeping expectations realistic. With toddlers and emotional preschoolers I especially have to remember that the kids have HUGE emotions going on in their little bodies and I can't expect the kids to be well-behaved all the time. I also can't always control how they are going to react to situations. Flexibility is king when it comes to toddler emotions, so by reminding myself about that, it makes it easier to stay calm when things don't go as planned... which is quite often. Speak clearly, simply, and specifically. When talking about problems with my kids I need to focus on the event at hand... and that is it. I also need to speak at their level and be very clear. Forgiveness is something I am learning about daily as a parent. By giving kids a clean slate each day I find that I have much less pent up anger too. Listen! I learn a lot when I listen to my kids tell me about problems or conflict with siblings. I even set listening as a parenting challenge for myself this year. Sometimes I jump to conclusions too quickly and after actually listening to my kids I realize that what I thought happened... didn't actually happen. Visualize a positive end result. I try and think about what I want to look like and act like when I am expressing my anger and then I work on fufilling that... so instead of being a mom who is yelling I visualize being a mom who is calm and has a successful conversation to teach appropriate behavior. Do you have any other suggestions for how to express and manage anger productively? Lauren! I am so glad to hear that it is making a difference. Thanks for taking a moment to share your challenge with me and tell me how it is going. You rock! I found this very helpful. I have four kids, and my house can get kind of crazy. The most difficult thing for me is learning to deal with my oldest daughter without showing anger. She is five and very strong willed. I know these are charactistics that I will envy in her as an adult, so I want to nurture them. But, there is a very thin line between strong willed and bossy and sassy. She tests my parenting chops frequently. Great post! Definitely something all parents could benefit from. I love that you said it's normal and fine to be angry, you just have to express it in the right way. Im with you there Dawn, only one but 5 and very strong willed. We have struggles all the time and I have tried numerous things to deal with it. She is allowed to be the boss of some things like choosing her own clothes, what she wants for breakfast and lunch (within reason). That seems to help. This post is extremely helpful.